On Friday the 28th of February 2014 the City Chambers played host to the Sports Person of the Year Awards which celebrated Scottish sport's action heroes, dedicated coaches and selfless volunteers who have given up hundreds of hours of their time to the sports they love. Around 250 athletes, sports fans, club leaders, school pupils, volunteers and coaches gathered for the celebrations as winners were revealed across 13 categories. 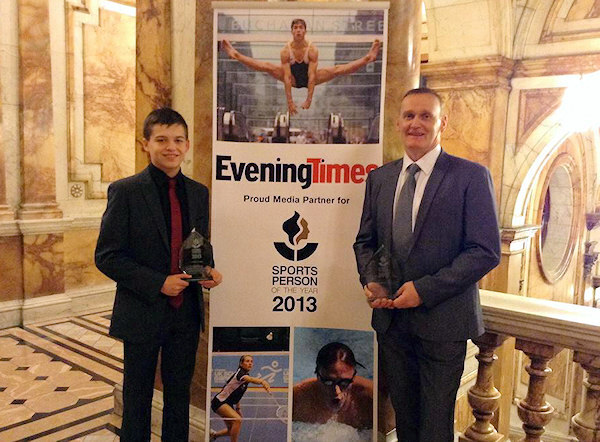 Karate star James Coulter was presented with the Young Sports Person of the Year Award by Evening Times assistant editor Graham Shields. 15-year-old James currently attends Whitehill Secondary in the East End of Glasgow and dedicates around 20 hours a week to training. Last month James attended the European Championships in Lisbon where the event was held at the, 13,000 seat, MEO arena. At the event James picked up the silver medal, matching his result from last years event. By reaching consecutive finals James became the first Scot since 1991 to do so and in the process reached a career-high of world number three. Over the last two years James has fought in four major international events in the USA, in all of which he has reached the final. Coming out with three gold medals and a silver, after having a total of nineteen fights from the four events. The events have been held in Las Vegas' Caesars Palace and the Paris, Paris Hotel with the high point coming with James winning and then defending the US Open in consecutive years. On the domestic scene James has also won every major UK title both individually and as a member of his Eastbank karate team.